Initialed in the lithographic stone. English: The dogs are again falling into despair after having heard that there will be a new dog license tax after all. In 1855, a tax on dogs had just been initiated in France and along with it came the first efforts to protect animals from cruelty. 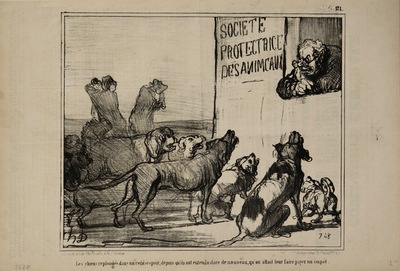 While Daumier’s print might be explained simply in these terms, it may also convey an anti-establishment attitude toward the French government. Published during the Second Empire, at a time when political dissent was suppressed, the dismayed dogs might metaphorically suggest disapproval of the government and its Emperor by the people.